Safety cat collars and wool catbeds. All unique, original design, made for something special that you do not find anywhere else. Custom orders are welvome. Worldwide shipping. 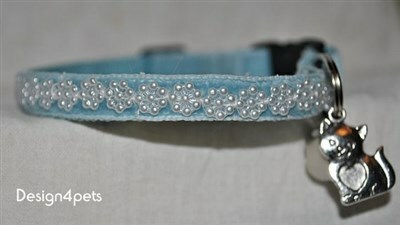 Beautiful breakaway, handmade cat collars, pearl ribbon handsewn with "invisible" nylon thread. For your cats safety made with breakaway buckle. Soft and light weight quality as every cats like it.